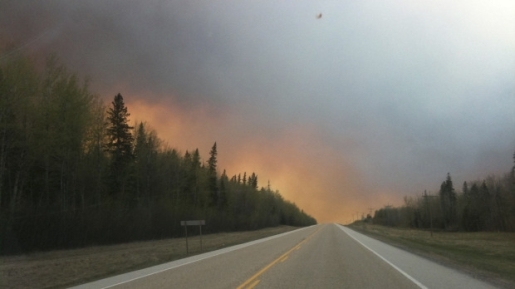 The only way in and out of Slave Lake is to drive through a wildfire. When it comes to scary situations, there’s nothing scarier than an oncoming natural disaster. For residents of Slave Lake, Alberta, Canada, danger has been all around them for awhile. Slave Lake is the epicenter of a series of raging wildfires in Alberta’s rich wilderness, but until now the situation wasn’t dangerous. Then, the winds changed. Now, the town of Slave Lake is completely surrounded by wildfires, dangerously high winds have made air evacuation impossible, and the only way out for residents is by car or bus. The Royal Canadian Mounted Police are working to put together a bus evacuation for residents whose cars cannot make the escape to surrounding towns, but the question is: will there be anything for Slave Lake residents to come back to? Already, the town’s radio station (and evacuation coordination area) has burned down. The whole town is without power. These folks may be saying goodbye to their homes for the last time.